Oh my word, I never fully understood what the heck Dolly was talking about “a cup of ambition” until I introduced the magic of MCT-oil-infused coffee into my morning routine! MCTs, short for Medium Chain Triglycerides, are extraordinarily health-promoting fatty acids that help everything from mental focus to weight loss, and they have been right under our noses for ages. And I am here to tell you how YOU can get more of them in your life and why you should. Trust me, this is a gamechanger and you will not regret it! Again, “MCT” is short for Medium Chain Triglyceride, also known as Medium Chain Fatty Acids, or MCFAs. To get all “science-y”, this means that they are triglycerides whose fatty acids have tails of 6 – 12 carbon atoms. They are considered “medium” because short chain fatty acids have 2 – 6, and long chain fatty acids have 13 – 21. All of these fats play important roles in our diet, with short being imperative to our colon health, and many of the long being the oft-touted “healthy fats” in nuts, olive oil, and fatty fish. Medium is the star of the ketogenic and gut-health-promoting worlds, though! These are just a handful of the more clinical benefits, but the real-life experience opens up so many more actual advantages. You can expect near-immediate energy, mental alertness that you have never experienced before, extremely suppressed hunger, an actual “warm-feeling” taking over your body, and an inexplicable desire to start your day earlier and get more accomplished! In my humble opinion, MCTs are THE fuel of productivity, whether you have an article to write, small children to wrangle, intense calculations to compute, or just a to-do list a mile long. Okay, Okay – But Where Do I Find Them? Chances are, you are ALREADY consuming MCTs in small amounts on a daily basis. They make up 15% of the fat in coconut oil and +/- 7% of the fat found in the dairy we as humans tend to consume (cow/goat/sheep cheese, butter, milk, and yogurt). That said, the amounts are SMALL, and if you want to reap all of the aforementioned rewards, it’s worth purchasing a bottle of pure MCT oil. Please note – I am not suggesting to remove any of these delicious food items from your diet. Coconut oil is wonderful for the body in so many ways, and you just TRY to get me to give up Brie cheese, my favorite hunger-annihilating snack! These foods have nutrient profiles that are also health promoting, especially grassfed butter, but MCT oil is such a superstar that it is worth supplementing. 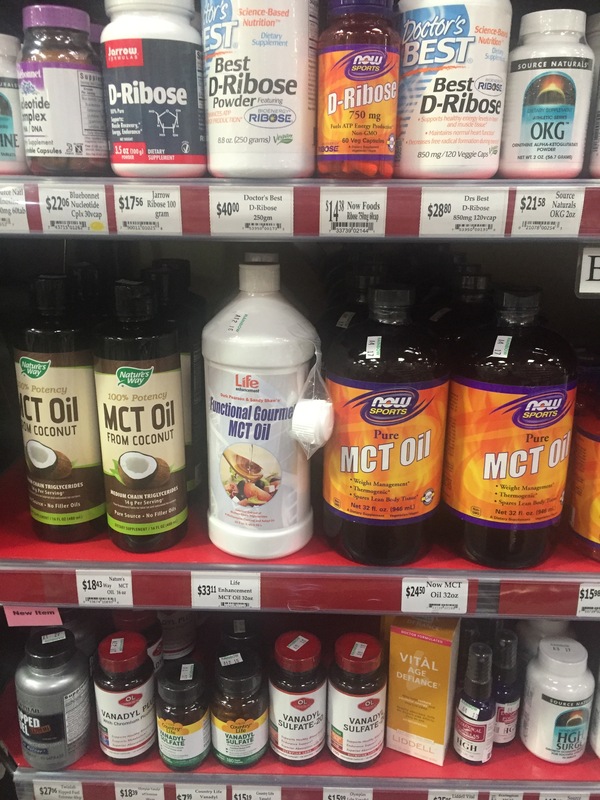 As far as purchasing straight MCT oil, there are a number of brands available either online or at health and/or fitness stores. I have experimented with a number of different brands (Bulletproof, NOW Brands, Nature’s Way), and to be honest, I have had fantastic results from all of them! Of course, I will continue to test out different types in search of the magic bullet, but buy what’s right for you. Judge the book by its cover, or what fits your budget. It is a very highly refined product, completely clear and essentially flavorless, so no matter what you choose, you will not likely be dealing with impurities or residual toxins whether it is organic or not. And How Should I Use It? There are a million ways to consume magical MCTs, and you will see this reflected in my future recipes. However, the easiest way – as you may have guessed from the beginning of this post – is delicious blended coffee! Pour YOURself a cup of ambition with this brain-awakening brew! Whether you use regular joe or decaf, this simple blended coffee will get you going and your inspiration flowing. 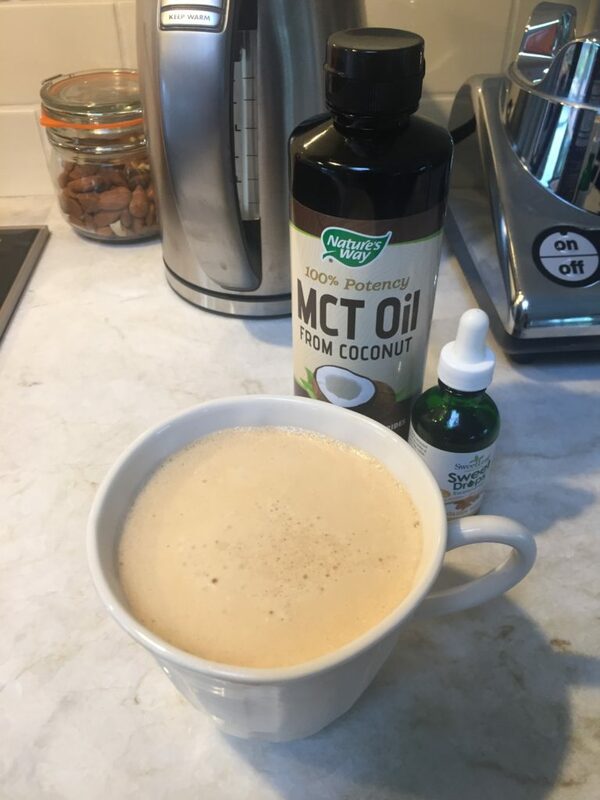 NOTE – if you are new to MCT oil, start with 1 teaspoon and work your way up gradually to 1 Tablespoon. Not building up slowly may lead to a phenomenon known as “disaster pants”. I am not going to explain, but DEFINITELY look it up! For added nutrition or to make this a longer-lasting hunger deterrent for intermittent fasting, try out one or all of the optional ingredients. Pour your coffee into a blender. Add the MCT oil, sweetener of your choice, and any of the optional ingredients. Place the lid on the top and blend at high speed until it looks creamy. Transfer to your favorite good-luck coffee cup and enjoy! Your mornings are about to change for the better, and you should keep a record of the increase in productivity, energy, and creativity that you are about to experience. 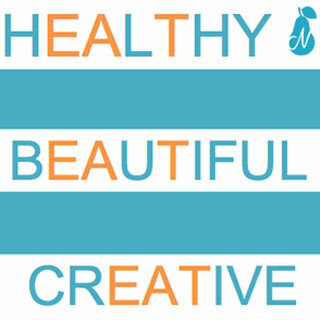 Share your experiences – I want to hear about how drinking MCT blended coffee changes your life! Let me know in the comments or through my Twitter, Instagram, or Facebook accounts! « Oodles of (Keto, Gluten Free, and Vegan) Noodles!